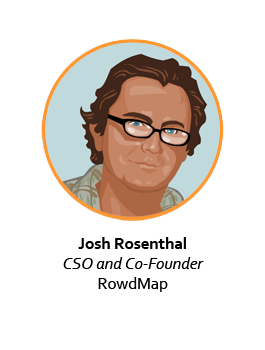 Josh is a Co-Founder and CSO of RowdMap. RowdMap’s Health Profit Intelligence platform creates Simple Growth, Performance & Value for Health Plans, Providers, Hospitals & Nursing Homes. Before co-founding RowdMap, Josh founded Sprigley (acquired by Eliza Corporation, 2008), a health engagement platform and data/analytic system that quantified qualitative data, while creating socio-graphic and psychographic metrics that measured and predicted interactions and interventions’ outcomes and impact. While at Eliza he created powerful new offering, which saw Eliza win accolades such as a Business Week Innovation award and named one of Entrepreneur Magazine’s 10 Companies to Watch in Health Care then he played a central role in the sale of a major equity investment in Eliza (Parthenon Capital, 2011). Josh received a Fulbright to the Sorbonne’s Institute for Advanced Studies (EPHE), an interdisciplinary think tank where he began exploring quantifying qualitative data, behavior change and complex systems. He’s served as an industry expert on technology and innovation, data & analytics and public data access to the Department of Health and Human Services, the Centers for Medicare and Medicaid Services, Office of National Coordinator & National Committee on Vital and Health Statistics, lectured at Harvard, Johns Hopkins, WHITE, WHIT, SXSW, etc.